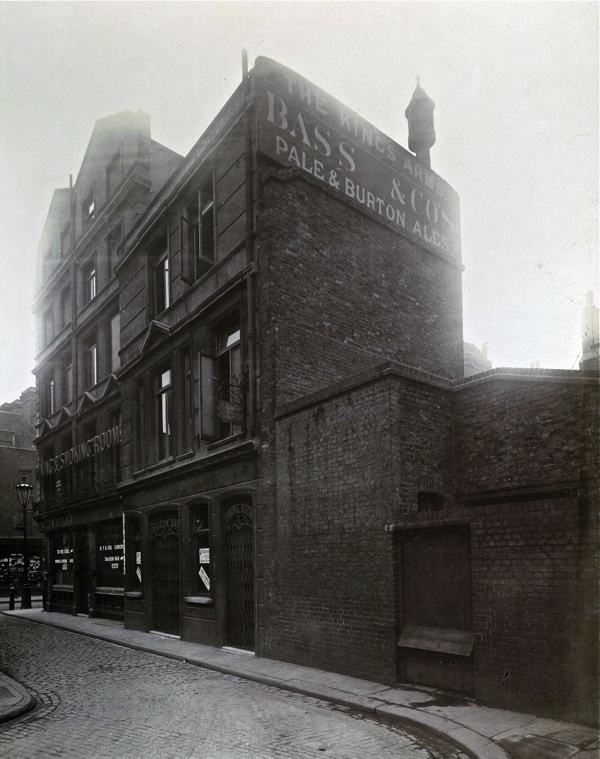 One hundred years ago, when the City elected to widen Bishopsgate – the ancient meandering thoroughfare lined with straggling buildings that followed the route of Ermine St, the Roman road north from London – Charles Goss, the first Archivist at the Bishopsgate Institute was inspired to get up early in the morning and photograph the streetscapes that were shortly to vanish from the world. 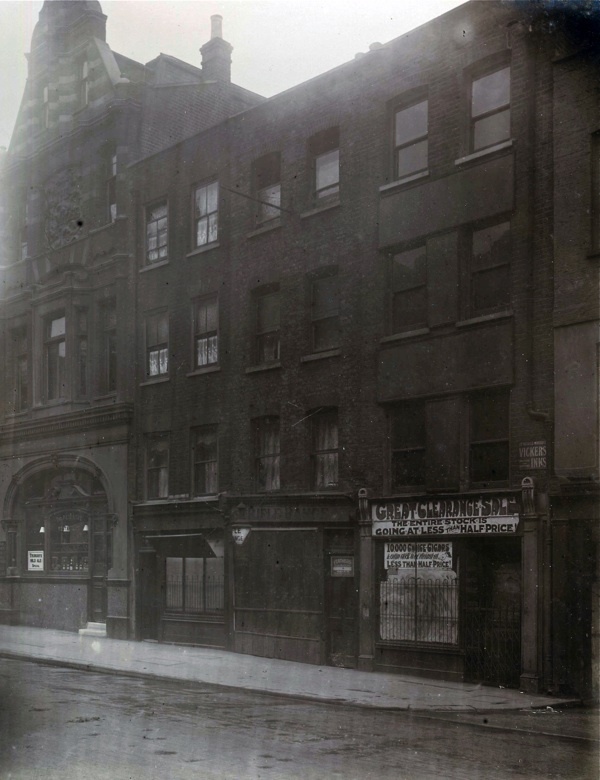 Working systematically, he took this set of interconnecting pictures that record the shabby old frontages at the northern end of Bishopsgate where it meets to liberty of Norton Folgate, concentrating on the west side of the street where the Broadgate Tower designed by Skidmore Owings and Merrill stands now. There is an ethereal quality to many of Goss’ photographs taken in the grey light of dawn, with just a few early birds on their way to work and no traffic at all on the road yet. These are quiet pictures in which silence is only interrupted by the echo of footsteps. 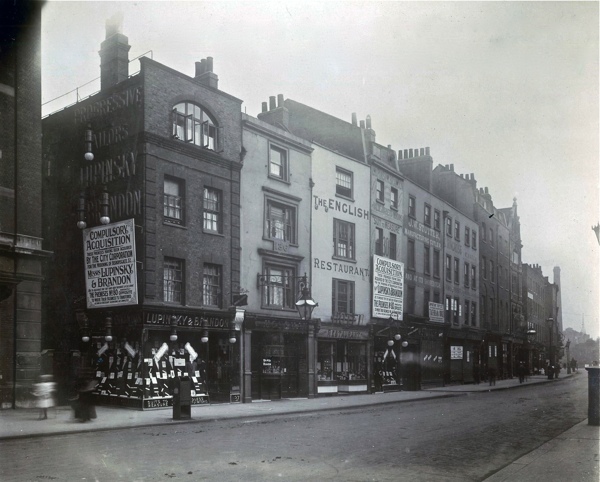 Hoardings upon Lupinsky & Brandon, the progressive tailors – suits to measure at 137 Bishopsgate – announce the impending destruction, “These premises have been acquired by the City Corporation for the widening of Bishopsgate Street.” Fortunately, business was transferring to 80 Bishopsgate directly across the road. 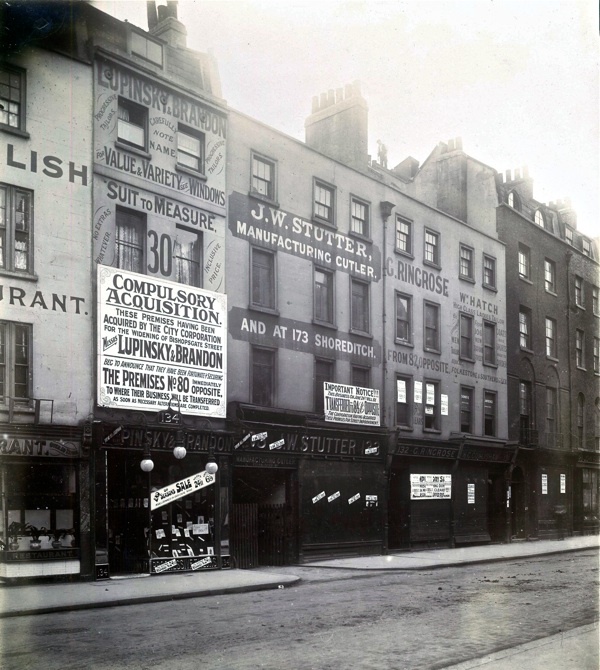 You will observe that many businesses had already held clearance sales and vacated their shops, but the Great Eastern Rubber Company, the Dump Shop and the Norton Folgate Toilet Club were valiantly trading on to the bitter end. 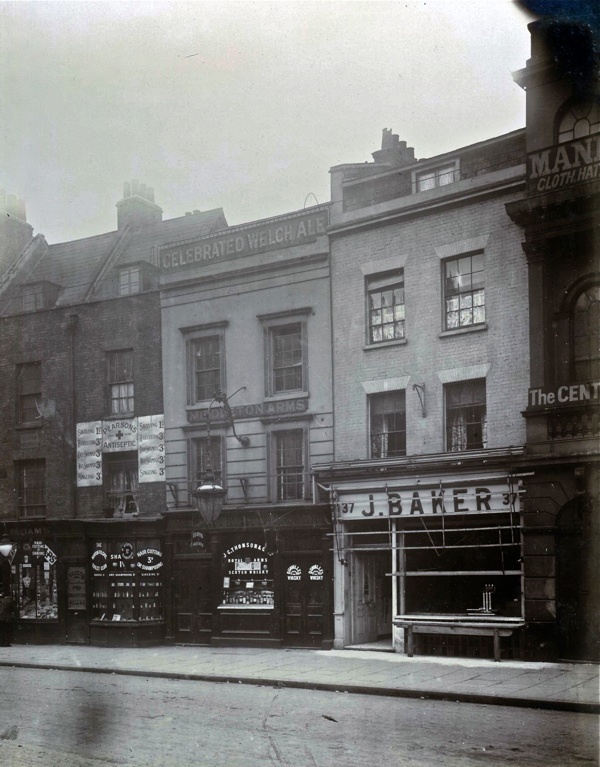 Like Henry Dixon’s images taken for the Society for Photographing the Relics of Old London that recorded ancient buildings about to be demolished in the 1880s, Charles Goss’ pictures belong to the compelling yet melancholic school of photography which illustrates the history of loss. 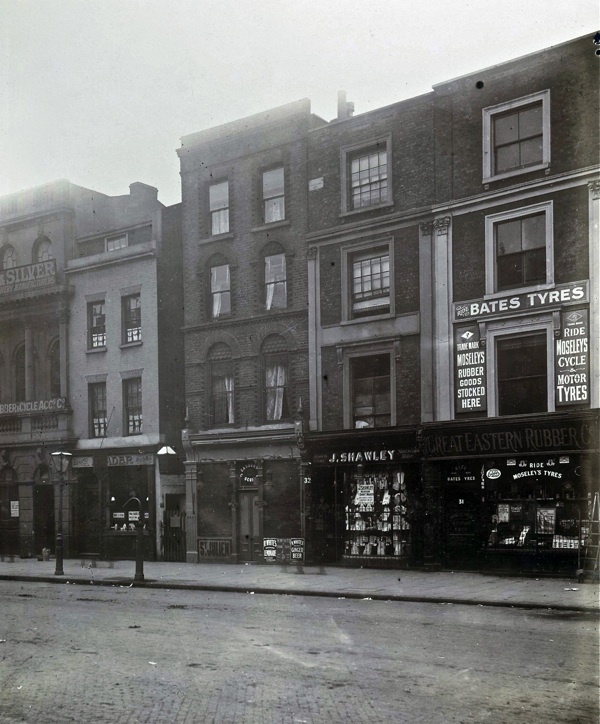 I can readily imagine Charles Goss getting up and leaving the house in the dark with his camera and tripod, and setting up on the pavement in Bishopsgate in the early morning drizzle, attracting curious looks from passersby and questioning himself even as he went about his business. Sensibly, he reconciled any doubt, bound the pictures into a fine book with a red leather spine and put it on the shelf at the Bishopsgate Institute, reassuring himself that he was just doing his job. Yet behind these pictures lies an unfathomable poetry that engages with the sheer strangeness of the performance of human life – rendered tangible only in the moment when the scenery is about to be abandoned and the familiar reality of the street begins to dissolve, just like an abandoned set on the back lot of a film studio. 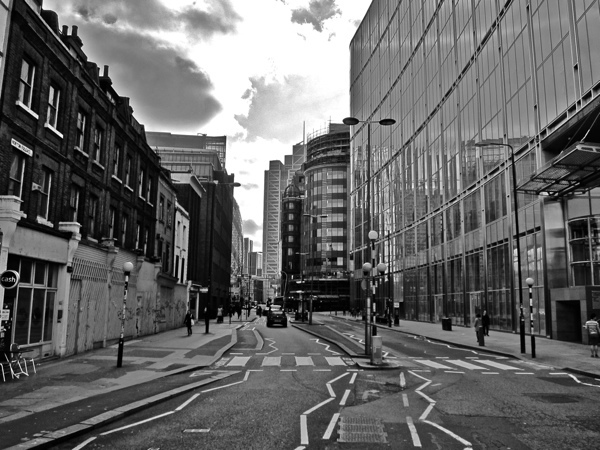 I can only wonder what Charles Goss would make of Bishopsgate today where just a few remnants of his time exist, entirely overshadowed by the vast disproportionate recent structures resembling illustrations to a futuristic novel by H.G.Wells. 10,000 choice cigars were sold here at less than half price. 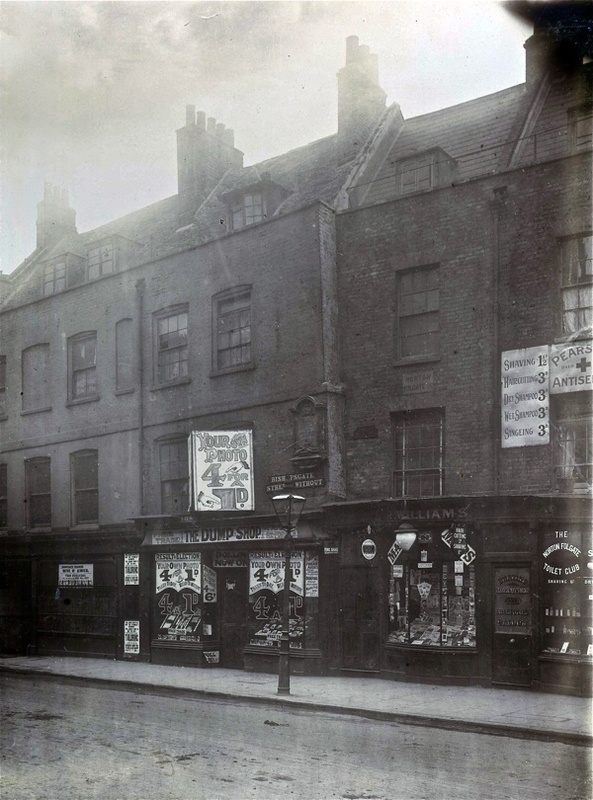 The Great Eastern Rubber Company, Mosley’s Rubber Goods stocked here. B.A. 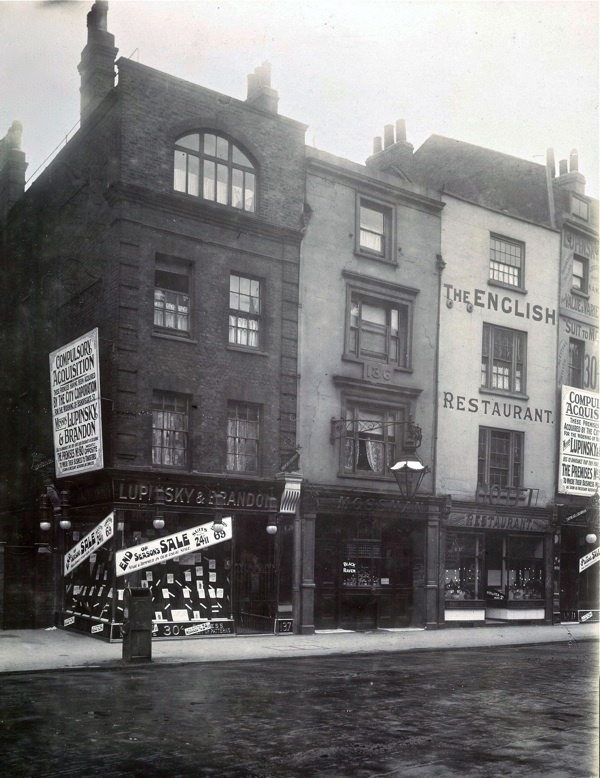 Marcus, Lilley & Skinner, The Lord Nelson and Devon Restaurant. The Middleton Arms for Celebrated Welch Ale. Lupinsky & Brandon, progressive tailors. Spy the roofer upon the ridge above G.Ringrose. 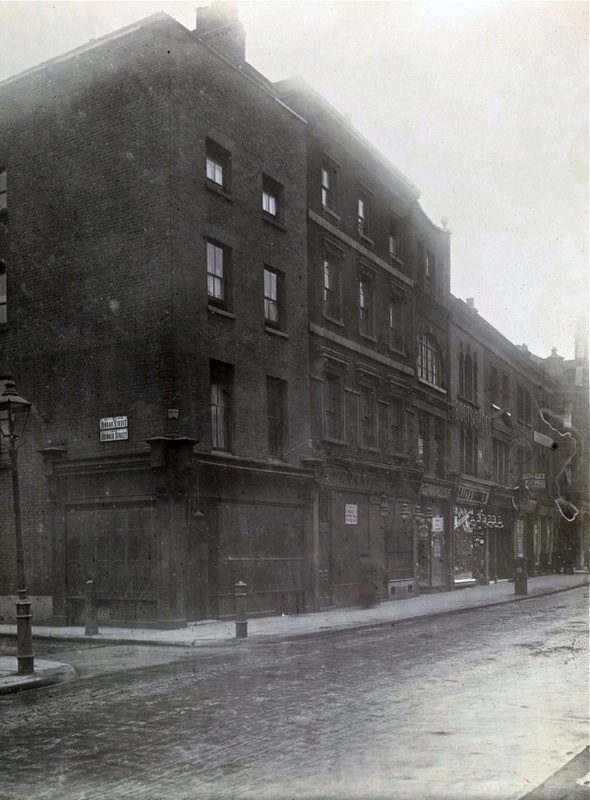 Observe The Dump Shop and the Norton Folgate Toilet Club. 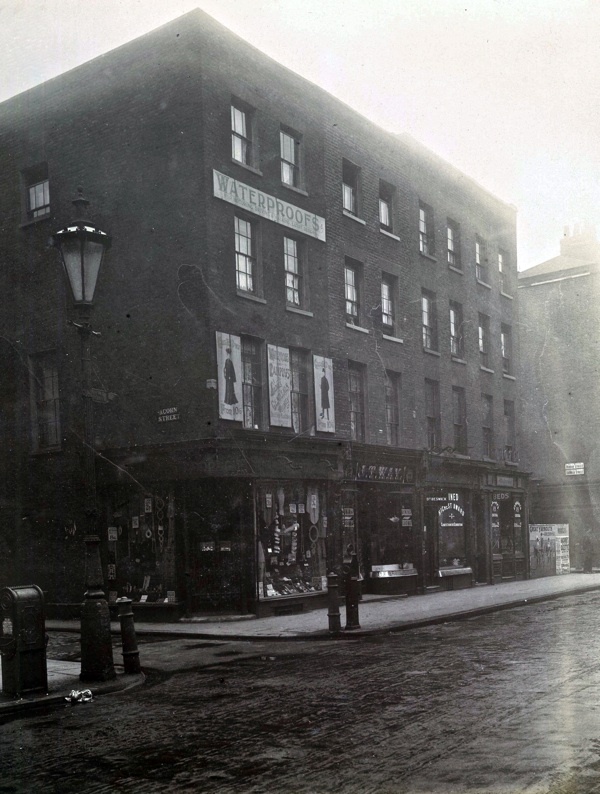 The early morning sun casts its shadow over Norton Folgate a century ago. These streets may have contained more people than we can see, but they wouldn’t have registered in the photographs if these were long exposures. For example, in the Lupinsky & Brandon, to the right there is a shop called Mossman. I see a man standing there with hands on hips, but I may be imagining it. 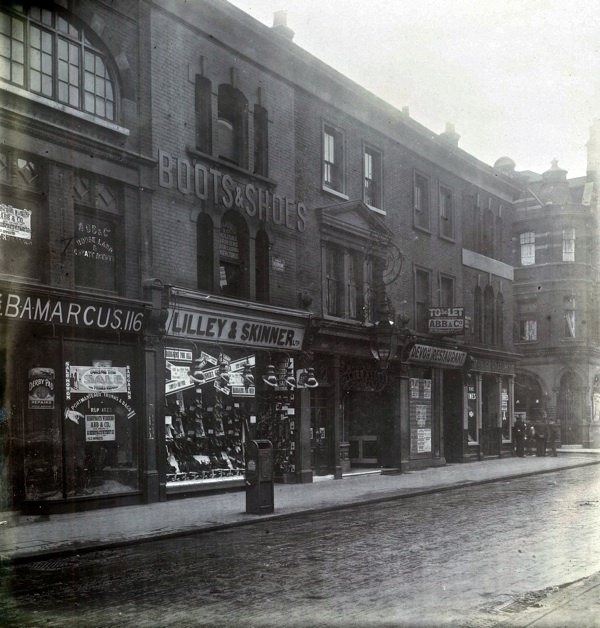 There are clearer ghostly feet in front of the Great Eastern Rubber Company and elsewhere. The Norton Folgate Toilet Club? The mind boggles! nice to day dream for a moment of roads without street markings, street furniture or cars. I preferred it the way it was. Did they welch on the change in the Middleton Arms ?. I remember the gas lit streets in my youth, the sky was a mass of stars and nobody was in a rush. I loved these pictures. The city was my stamping ground for a few years in the 1980s and Bishopsgate lingers in the memory as it was always so windy! But what is a ‘progressive’ tailor?! Now, now Theresa..my x5 great-grandfather, John Davies was baptised in St Botolph’s Bishopsgate on 10 June 1739 and married the daughter of a Norton Folgate man. Their son became a hand loom silk weaver. Times had clearly been hard and solidarity was much needed – hence the Toilet Club! 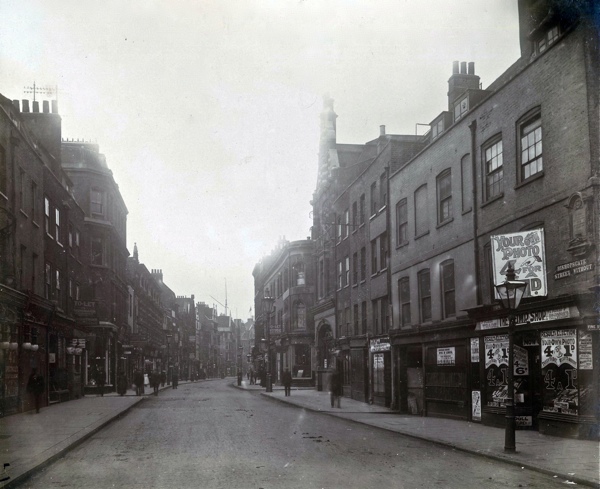 Definitely prefer the old streetscape! @ Deborah – one that cuts a pattern to actually fit you rather than just assembles a series of tubes in various sizes to cover you. and re the “toilet club”, it probably helps that attending to one’s toilet used to mean all the various things one did to prepare oneself for the day or for bed at the end – generally keeping oneself neat, tidy and clean, and would include everything from washing to brushing one’s hair and dealing with makeup. Ultimately derived from Old French, meaning “cloth”, and presumably entering English as the cloth one washes oneself with. These are wonderful old photos. 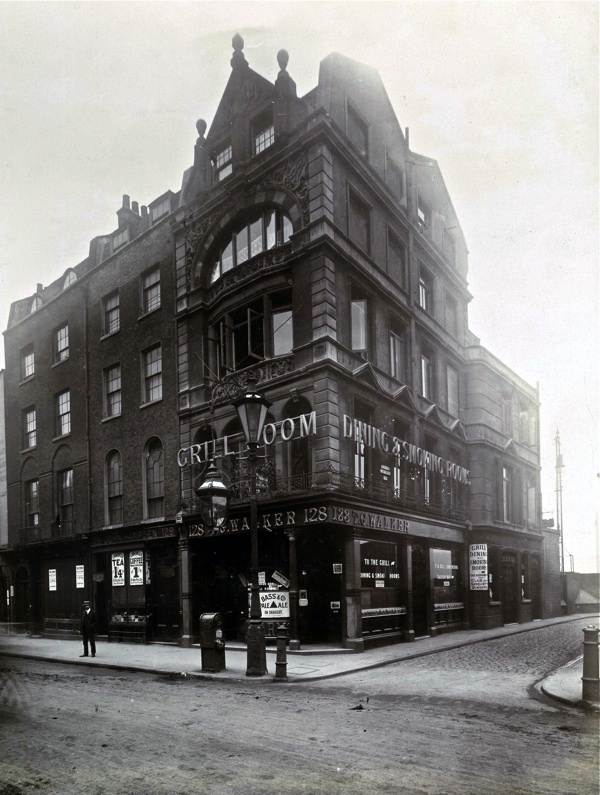 If you’re a fan of this then I’d recommend Lost London, which has hundreds of beautiful photographs of London buildings that have since been demolished or destroyed by the war. Pedantry time… the Broadgate Tower was designed by the firm Skidmore, Owings and Merrill, not Foster & Partners. My Great grandfather Charles Kirby was born in 24 Acorn St on 1st November 1861.His father John was a master cabinet maker and he also became a master cabinet maker.I believe this street lies under Liverpool St station. 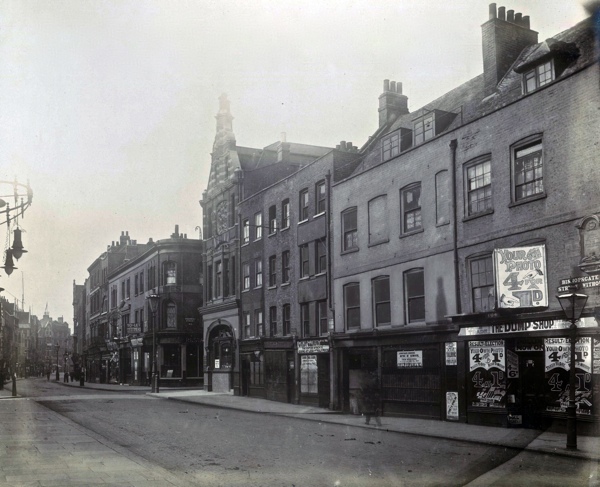 Yes Acorn Street was demolished to make way for Liverpool Street Station as were all the other adjacent streets. My Grandfather Henry Matthew French was born at 2 Lamb Alley. Other members of the family were born at Blyth’s Buildings, Angel Alley, Sweet Apple Court. Great to obtain these photos especially the ones of Acorn Street, but I would dearly love to obtain photos of any of the other streets mentioned.